This is my third go around on building a table for our ShopBot. Each one has used a different system to allow us to index our parts on the table for accurate placement. 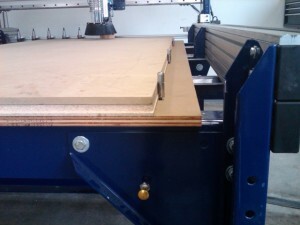 This time I wanted to implement a system that would allow us to align full sheets accurately on the table, accommodate alignment of smaller parts and allow us to take full use of the “Flip Ops” function of the ShopBot Link. 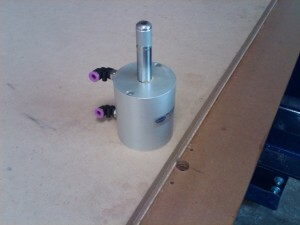 Flip Ops allow us to add machining to the “flip” side of cabinet parts cut using the SB Link. Most parts of a SB Link cutting file seem to fly by fairly quickly, so having an index system that is both robust and fast acting is a real plus. As a side benefit this one is simple, too. You can see the holes for the piston and mounting bolts next to the cylinder. Note the extension bushing and bolt added to the piston. I cut 3 sets of these holes with the Bot. Due to table framing, these were centered at 6”, 32” and 70” in the X direction and at -.3125 in the Y. This puts the edge of the 0.625” piston at zero in the Y. Trimming the oversized fence after it has been installed on the pins assures both positional accuracy and squareness of the fence. In my case, both the X and Y position is 3”, but any number can be used. To use this fence for Flip Ops with the SB Link, all that is required is to add those coordinates into the Link’s Flip Op fence location. 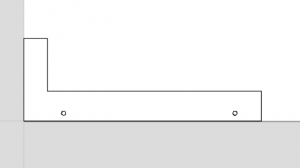 For VCPro cutting files, adding 3” as a 2D offset into both the X and Y boxes of the fill-in sheet is all that is required. Parts are designed at a normal 0,0 position. You could also place the parts with the corner at 3,3, but my personal preference is to use 0,0 and the offset. The 2D offset feature allows us to change the location of the fence at a later date or trim it if damaged. The picture below shows the fence in place, after trimming. In conjunction with disposable plywood zone masks placed tightly to the parts, helps stop parts from sliding. By using holes bored into parts or their borders, a part that is larger than the table can be moved and repositioned onto other pins for second half cutting. Long parts can be very accurately positioned at the Y=0 edge of the table. 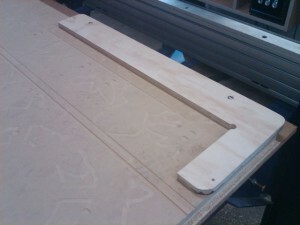 For repetitive work, parts holding jigs with pin holes in them can be used interchangeably as needed. I am sure that after using your version of this versatile accessory, you will come up with a myriad of uses. 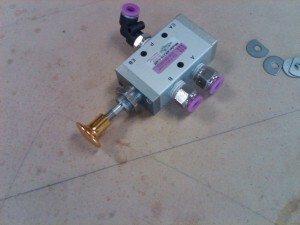 Next Month: Vacuum manifold…. Have I ever said how much I hate plumbing?